people searchYou can see the list of people whose interviews are the basis of this project. You can search and filter the interviewees on the basis of county, gender, age, and decade of interview. 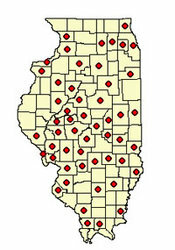 county mapYou can use an interactive map to find interviewees by county. On each interviewee's individual page, you can find and read the transcript .pdf of the interview. collection searchThe interviews come from several collections, both older and new. In this section you may view the listings by the collection source, or the basic type of interview. An important part of this project was the development of a subject index for the interviews. You can click category items by Name, County, Years, and Topics. The "Current Search" at the top helps you keep track. The numbers in [ ] after the choices tell you how many results you will find. 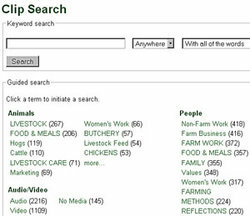 clip searchYou may also type in a search term. The keyword search is very literal, so you will have different results with apple than with apples, for instance.